Music and dance of the tribals are always closely associated with their rituals or festivals. The vibrant Karam dance is performed during the popular Karam festival in which the Karam tree (Haldina/Adina cordifolia, kadam, kadamba) is worshipped as a symbol of productivity and fecundity - to propitiate abundance in terms of children as well as crops. It is widely prevalent among the tribes of eastern and central India like Oraon, Munda, Santal, Ho, Kol, Bhumij and Kora. It was also adopted by non tribal communities like the Kurmi Mahatos and several scheduled castes of the region, who possibly Hinduized the rituals. Another school of thought opines that it started from the castes in the Chhota Nagpur belt and was later adopted by tribal communities. Whatever its origin, it has always been associated with agriculture and fertility. 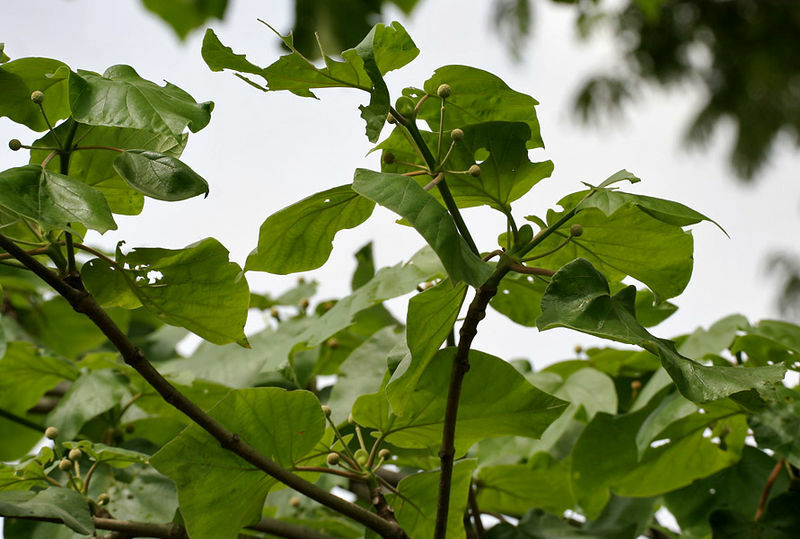 The festival probably originated in the western part of what was known as Rarh Bengal (occupying parts of West Bengal, Bihar and Jharkhand) and there are various myths behind the practice of this tree. According to a legend among the Bhumij, Ho and Oraons, there were once seven brothers who lived together. The six older brothers would go out to work in the field while the youngest stayed at home with his six sisters-in-law. They passed their time dancing and singing around a Karam tree in the courtyard. One day while all of them were thus engrossed, the morning meal of the brothers was forgotten and was not carried to them by their respective wives. On returning home, the agitated husbands uprooted the tree and threw it into the river. The younger brother left home in anger. Hard times then befell the family - their house was damaged, their crops failed and they were on the brink of starvation. Meanwhile, the youngest brother happened on the Karam tree floating in the river. Worshipping the tree deity and seeking forgiveness on behalf of his family, the young man returned home and the family`s fortune was restored. Thus began the worship of the Karam deity. The Santal legend however centres around Karmu and Dharmu, the sons of Kamru Guru and grandsons of Pilchu Haram and Pilchu Budhi. There are many myths which prevail. In one version, Karmu and Dharmu are believed to have sustained themselves after their father died by begging at the various garhs (forts) of the region and by also looking after cattle. One evening Dharmu (the younger brother), fell asleep under a tree and dreamt that Karam Gosain the deity of the Karam tree had asked to be worshipped. 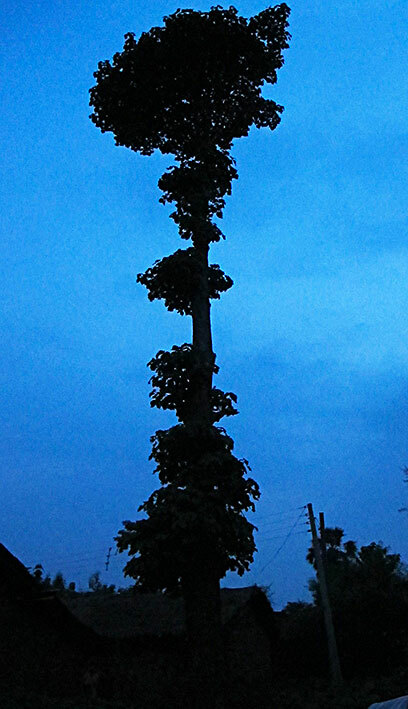 Though Karmu refused to be convinced, Dharmu cut some branches of a karam tree and started worshipping the tree. So engrossed did he become in his singing and dancing around the tree, that he forgot all about his cattle who would often go without food. Karmu, outraged at Dharmu`s callousness , stormed in one day and threw the branches into a nearby river (Gaya-Ganga). The outcome of his deed was instantaneous - the brothers` lives were thrown into complete disarray and poverty. Realising his mistake, Karmu decided to make amends. The brothers went out in search of the branch and through it , seek Karam Gosain and beg his forgiveness. In their travels, they encountered different people and a variety of situations, and each of these served to augment their social knowledge. For example, they came across a tree burdened with rotten fruits, which thus could not be enjoyed - thanks to a curse upon it. Groaning from its huge load, it likened its fate to a man who refuses to share the fruits of his knowledge. They came across people who had sinned in some way and were suffering from it as a result. Thus, there was a lesson to be learnt at every stop. They realized it was only Karam Gosain`s blessings that could reverse their misfortunes. It was only when they found the branch that balance was restored almost instantaneously - in the form of clothes, cattle, and of course the tremendous wealth of knowledge they had gained. This is how Karam worship among the Santals started. Various forms of Karam are celebrated with regional variations of the names, the purpose of the worship and the periodicity. The Dangwa Karam festival for instance takes place every five years while the Mora Karam takes place when there are many deaths in the village. Sometimes, even the language of the chants and rituals vary within a single community. However in general, the purpose of Karam is to propitiate the tree deity in order to increase prosperity or progeny, or to bring blessings upon brothers and protect them from harm or to protect the family from disease and other calamities and to ward off evil spirits. 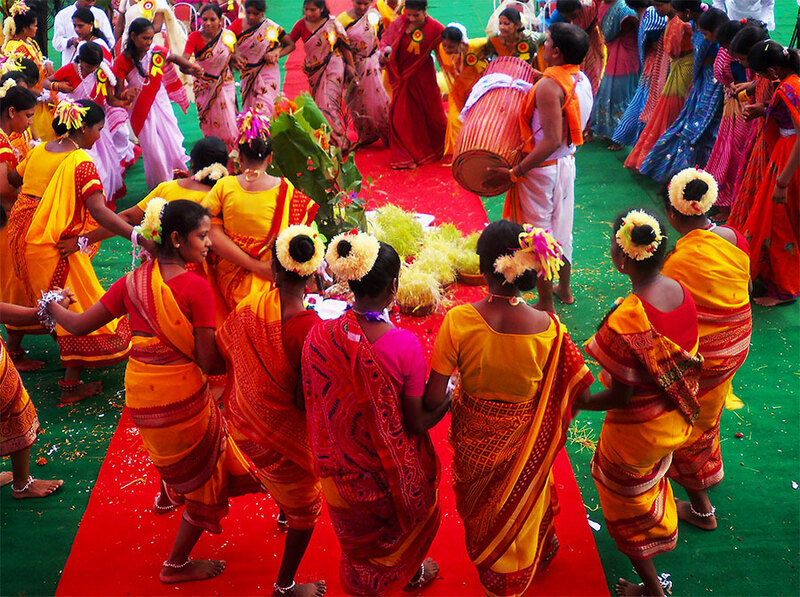 The most popular and most important form is the main Karam Parab (festival) which is celebrated annually on the 11th day of the moon in the month of Bhadro (August-September) in the Bengali calendar by the Santals and Oraons or on Jita-Ashtami, the 8th day of Ashwin (September-October) by the Mundas or on Rash Purnima (full moon day) of Kartik (October-November) among the Koras. The festival could be organised by individual households or by the whole village en masse. Sometimes neighbouring villages, who have not been able to organise their own parab, join in the festivities. During this festival, the bough of a Karam tree from a nearby forest must first be cut with a single, neat blow by a chosen bachelor of the village in the night. Amidst the sound of traditional drums, young men and women sing and dance around the Karam tree at the start of the ritual. The bachelor cleans the area around the tree and covers the ground near the tree with a paste of cow dung. He then circles the tree seven times, tying a white thread around its trunk and dabs the tree with vermillion. He then burns incense and ghee (clarified butter) in a small fire near the tree and begins his prayer to the Karam deity, facing east and seeking the deity`s blessings for crops, wealth, children, village and country. He then showers rice on the tree and then climbs on to it to cut a four to five feet long branch with three smaller branches. Meanwhile, the girls also pluck Sal leaves The falling branch must not be allowed to touch the ground and is caught mid-air by either the girls or in some cases, the boys. The girls carry back the branch along with the Sal leaves most carefully to the village centre or akhra or to the kulhi, the common yard in front of their homes with the group singing and dancing all the way. The entire community gathers around the branches which is then planted in the soil with great ceremony. The bough is venerated by the village head who lights a lamp, smears vermillion and sprinkles rice and hnaria (rice beer) on it. With this, the installed Karam branches thus transform into the Karam deity variously referred to as Karam Raja or Karam Deo. The actual rituals may vary from tribe to tribe or regionally. About a week prior to the ritual, unmarried village girls, who go on a fast, sow seeds of five different crops, or sometimes just barley seeds, sprinkle it with turmeric infused water and watch over the seeds as they germinate and sing songs during the process. The germinated seeds are known as Jawa Phool. After the Karam boughs are planted, the girls carry the young shoots to the Karam altar in a small bamboo or wooden basket along with flowers, a cucumber wrapped in cloth, rice grains and other offerings, all symbols of life and sustenance. The girls are carried around the tree seven times and after all the fasting girls have completed their circumambulation, the shoots and rice grains from their baskets are distributed to all the villagers present. Then begins the chanting of the Karambinti - stories about the origin of earth according to Santal mythology (or its equivalent by other tribes) - by the Karam guru or a village elder. At the end of the story, the boys get up to dance while the girls return home to break their fast and receive gifts from their parents. The entire community later returns to participate in the dancing and singing to the beating of drums around the Karam altar. The celebration goes on through the night until the wee hours of the morning, accompanied by copious quantities if rice beer (hnaria). The festival ends with the ceremonial immersion of the Karam bough in the morning in a nearby river or tank. The Karam songs sung by the Oraons have a strong element of the Jhumur in them. While the Oraons of the Sunderbans sing mythological based or kirtan based Jhumur songs during Karam, the theme text, rhythm and language of these are in wide variance with the Karam songs of the Oraons of the Chhota Nagpur area. These latter songs are in praise of the Karam festival. In recent times, as a result of promotional efforts by the government, tribal dances are also being performed on stage, out of the ritual context.